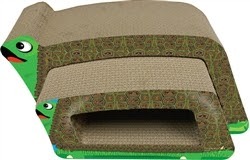 Imperial Cat scratchers are made in the USA of 100% recycled cardboard. They are eco-friendly and are loved by cats. These are not your ordinary cardboard cat scratcher. These are the unique way to offer your cat a special place scratch, rub and sleep on. Each large scratcher comes with a bag of certified organic catnip too. You will find many shapes from the Purr-fect Stretch, Large sofa, dolphin, whale and turtle combo scratcher. The Vogue scratcher is brand new and has become a favorite for those of you with more than one cat. It is 2 scratchers in one. Mickey's Pet Supplies ships for free on your $75 order. You will find great cat wands, natural cat toys and more. Call 877-863-5431 to order anytime.